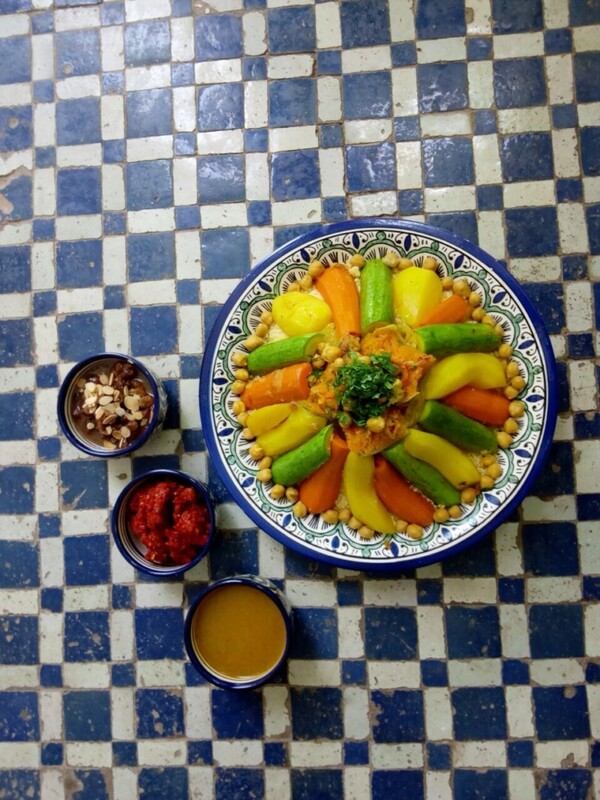 Every Friday like clockwork in households all over Morocco, carrots, courgettes, turnips are bought, cut and cooked in order of their density. Seasonal vegetable variations such as aubergines and peppers in the summer, rich red pumpkin in the autumn or cabbage in the winter are added along with a choice of meat and chickpeas, onions and saffron and a special mix of spices known as Ras El Hanout, literally translated as the head of the grocery shop. Couscous grains are steamed, three times at least, and turned out into the ‘Khissa’ the wide flat earthenware bowl that is used daily for making bread and on Fridays couscous steaming. Each grain is separated by expert hands and either butter, oil or smen (a traditional soured butter) are added. The couscous will gain at least three times its volume during this procedure. As it is steamed over the vegetable and meat casserole, it is also be perfumed by the Ras El Hanout spices. 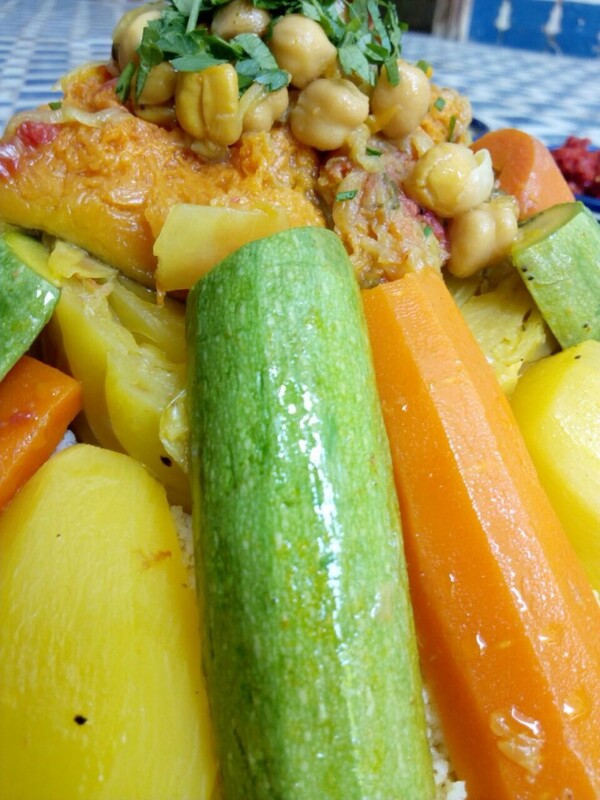 Once all is cooked to perfection the couscous grains will be piled up in a pyramid, and the meat and vegetables, chickpeas and other pulses will be arranged to form a delicious feast for the eyes, body and soul. Couscous is one of the most extendable dishes easy to share with unexpected visitors, with relatively simple ingredients. But that is not to say that it is at all easy to make. A poorly made couscous can be an insipid watery overcooked mush on a dry bed of grains. A well-made couscous, like that of my sister in law Mina, is a dish from the gods, and not to be missed on any occasion. Being seated around a central dish of couscous is a ritual that marks the end of the week, a moment of drawing the family together. It is also the dish that is served during important family events, when time is spent together in honour of those with us or those that have recently departed. During the period of mourning in Morocco, the strengths of the extended family are apparent as a well oiled. Beautiful organisation slots into place to ensure that those that are mourning. Those that come to pay their respects are fed, and that those who have departed are honoured. The women take turns to bring a meal each day or to come over and allow those mourning to not have to perpetually produce meals but to be able to come to terms with their loss. Couscous is the natural choice of dish. In Fez this June, a lot of Couscous was eaten as my father in law, one of the wisest men I have had the chance to share time with, passed away leaving a gaping hole in the lives of his family and friends. And back home in France, when our children were all with us, more Couscous was prepared, by me this time without the guidance of Mina’s expert skills, to pay our respects to ‘Beba’, as he was known, literally father in Arabic, head of our extended and wonderfully diverse family. Some of his traditions may have been diluted by immigration and nearly a century of movement and change, but the base is as solid as he was. He will live on through moments like this when his children, grandchildren and great grandchildren sit together around a steaming dish of couscous and our bodies and our spirits are fed.